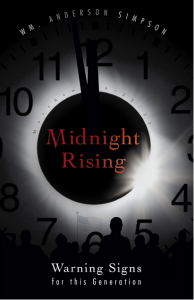 This book (forwarded by Earl D. Radmacher) is a recent composition regarding end time events. Simpson is dispensational, pretribulational, and orthodox in his basic eschatology. His point of view here is that the antichrist, though coming out of the European revived Roman Empire, will be an American, most probably the president. He sees the little horn of Daniel’s prophecy as being transplanted from among the ten horns and yet controlling and ruling over them. He sees the fourth beast of Daniel as a mechanistic end-time power that will rule by might, hence, the United States. Simpson also believes that the believing generation alive before the rapture will be able to discern who the antichrist is though he won’t be revealed to the world until later. Simpson (writing about a year ago) believes that President Obama could (but not must) fulfill this prophecy and that all the players on the stage are in place and even moving! The view of the United States is plausibly interesting and, I think, is valuable in keeping the U.S. in its proper place as a gentile nation, but Simpson’s confidence that we are definitely in the life-time of the antichrist may or may not be the case. Imminency is good but can sometimes be too adventurous.